Flash is made from a pale grey colour material with a white material for her belly and black button eyes. Although reading is difficult under the water! Flash was introduced on 8th January 1994. 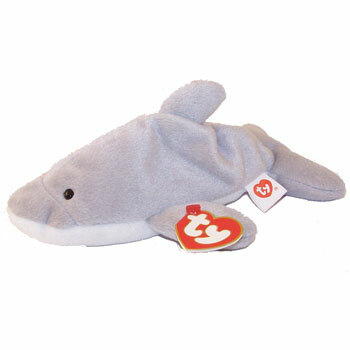 She was one of the original nine Beanie Babies. None of the first generation swing tags included a poem so it wasn’t until her 4th generation release that Flash actually received a poem to her name. Flash and Splash are supposed to be a pair, with Splash being the one who taught Flash to read, so the poem suggests. She retired on 11th May 1997.